Blois has a good selection of hotels both traditional and modern, near the train station (Gare de Blois) and down the hillside in the city center. 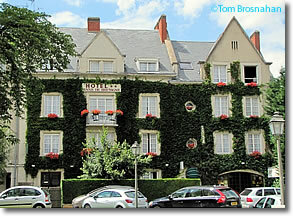 Right across boulevard Daniel Dupuis from the Gare is the Best Western Hotel Blois Château. The Hotel Anne de Bretagne is a short walk east from the station along avenue du Docteur Jean Laigret. Down the hill from the station on rue Jean Moulin are the traditional Hotel Renaissance and the modern Hotel Etap. a short walk from the Gare de Blois.